Today may have been Tuesday but it sure felt like a Monday for many reasons. After work, I ran a few errands – stopping by the chiropractor for a much-needed adjustment, getting gas on the Missouri side of the state line to save about 7 cents per gallon and running by the pharmacy where I had to deal with the new insurance card that evidently wasn’t on file by having my husband, Sparky, text me pictures of the new card. By the time I got home it was after 7pm. I was hungry, so the Little Caesar’s pizza in the kitchen was a welcome sight. But the first official stop I needed to make was the bathroom. Seriously, I don’t need to explain this do I??? After “taking care of business”, I was washing my hands when I heard my husband trying to open the door. We’d been having some problems with the doorknob for a few days prior to this. We figured that the knob was sticking and just needed some WD-40 or something. It had made me nervous enough that I didn’t latch the bathroom door this morning while I was showering. I didn’t want to have a repeat of the TGI Friday’s Incident. For the life of him, he could not get the door open. I dried my hands and tried to open the door from my side. Uh oh..the knob offered no resistance whatsoever. It just turned, and turning it was obviously doing nothing. Wild doorknob turning from me on the inside of the door and Sparky from the outside of the door ensued. “What about a debit card?” They always worked in episodes of those terrific shows from the 80s – Magnum PI, Simon and Simon, The Love Boat. “The collar will only turn like 1/32 of an inch and I don’t have any tools.” There was silence on the other side of the door. Did he leave me locked in the bathroom? I heard the garage door open downstairs. He was getting tools I bet. As I waited for him to bring some tools back up with him, I was messaging a friend on Facebook. “Sorry I’m cracking up, is B home? or is it a plan to call a hunky fireman? ?” Oh how interesting it would have been to have the hunky fireman come spring me from my bathroom. About this time Brian came back upstairs with a flathead screwdriver and a small Phillips screwdriver. There was a lot of banging from his side of the door and then all of a sudden the flathead screwdriver appeared on the floor, sliding in under the door. I was already laughing at my friend choking on her coffee and having to shut her office door in order to not draw attention, so the screwdriver appearing out of nowhere made me laugh even harder. 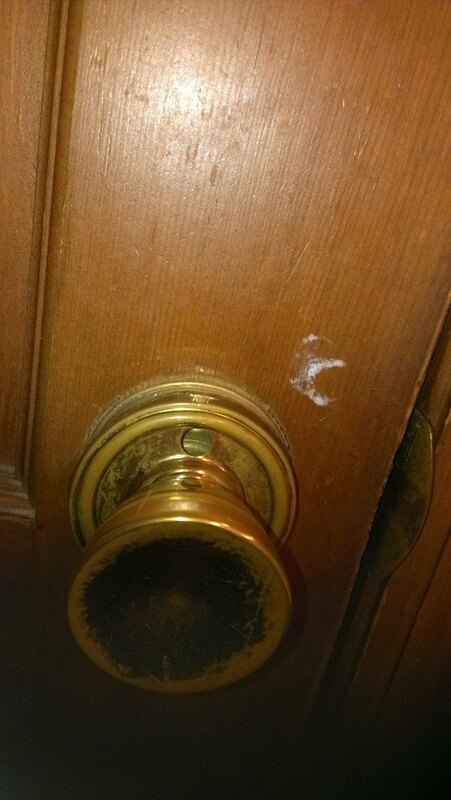 I went about trying to loosen the collar on the doorknob in search of the “hidden screws” that we would need to access in order to try to get the knob off the door. I decided I need to record this event for posterity and took to social media, tweeting and sharing my dilemma on Facebook. “Like I want to be locked in the bathroom? I’m hungry dammit! !” I started laughing again at our ridiculous “argument.” In the mean time, I got the rest of the collar loose and was able to get to the stupid little screws holding the knob in place. Why the hell would the heads of the screws be on MY side of the door? Does anyone actually keep tools in their bathroom for just this type of situation really? Maybe I should have a set of screwdrivers in each room in my house. After getting the screws loose and removing the door knob, we still weren’t able to get the “male” part of the doorknob out of the “female” part of the door (I’ve been around electricians for too long evidently if I start describing things as male and female). But now I could see Sparky through the hole in the door causing even more laughter. I was crying. He probably thought I was seriously losing it. On second thought, he knows better – I already had long ago. While Sparky chipped away at the rest of the damn knob mechanism that wouldn’t cooperate, I continued to share this on twitter and Facebook. One friend was entertained by the fact that I had my phone in the bathroom with me conveniently to record all these happenings. I always take something to read everywhere – the grocery store so I can sit in the truck and read while Sparky gets a Red Bull, the doctor’s office since it usually takes forever to get in, etc. This was no different. I have plenty of reading material on my phone, and you don’t necessarily know how long you’ll be in the bathroom – although this situation was a bit ridiculous. Finally after fighting with this stinkin’ knob for at least a good half hour, Sparky sprung me from my bathroom prison! Sadly there were no free drinks this time….but there was technically free dinner! I’m getting to the point where I’m wondering if I should just start using the bathroom with the door open. Ummm…..maybe not. Ahhh channeling Lucy?! You HAVE to be my hub’s unknown sister. The man cannot go anywhere w/o an incident. And it’s always hilarious.